Cancer Patients May Benefit from Chiropractic Care! I found this research paper from the Annals of Vertebral Subluxation research and got very excited about it so I thought I’d share. For those of you suffering with immunity issues (coughs, colds, rheumatoid arthritis, Crohns disease, cancer, Aids, etc) it brings evidence and hope that the body when free from interference can heal itself in many ways. Enjoy! Dr Craig. Recent research reporting on improved quality of life in a 24-year-old woman reveals that chiropractic may play a valuable role in managing people with cancer. The research, which is available in full in our office, includes a review of the literature supporting the role of chiropractic in patients suffering from cancer and its related health challenges. According to chiropractic researcher Joel Alcantara DC as many as 91% of adults with cancer use complementary and alternative therapies to help manage their recovery. Research has shown not only that a healthy spine relies on normal structural integrity and joint movement, but that complex neurochemical communication and pathways involved in helping humans to develop and function normally are tied into spinal biomechanics and their related neurological pathways. It turns out patients are using chiropractic care and other alternative therapies to help deal with the stress, depression and anxiety of being diagnosed with cancer and other ominous diseases. The patient was examined by the chiropractor who found decreased spinal range of motion and tenderness throughout her spine. X-rays were taken of her spine which revealed structural shifts in her neck and lower back. 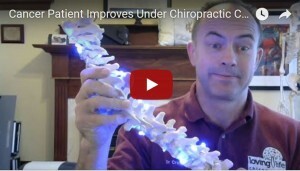 These structural shifts can lead to obstruction of the nerves and it is this obstruction, called vertebral subluxations, that chiropractors correct. Nerve testing revealed obstruction of the nerves. By the patient’s second visit she reported a complete resolution of her low back pain and neck pain. Shortly after she began to sleep for a full eight-hours through the night for the first time since being diagnosed with renal cell carcinoma. Along with improved sleep, the patient became more emotionally stable and her quality of life improved. She noted that co-workers, friends and family had noticed a more positive demeanor at work and in social settings. She also reported that she was no longer getting sick from taking the cancer medications and that she could go on a vacation with her friends without being extremely ill from her medications. The authors of the study call for more research on the role of chiropractic care in these types of health challenges. Kimberley D, Improvement of Sleep & Quality of Life along with Reduction in Dysautonomia & Pain in 24-year-old Female with Stage IV Renal Cell Carcinoma Undergoing Chiropractic Care. A. Vertebral Subluxation Res. Oct 2018.